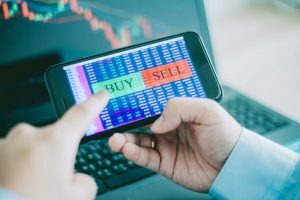 One Monday, I told you how Jeff Bishop – the brains behind Weekly Money Multiplier and founder of RagingBull.com – made $50,000 from four trades in 10 days. 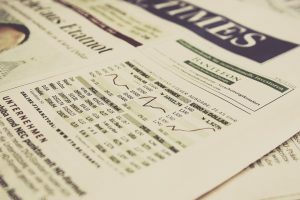 “Really big trading day for me today, and I hope for you as well. You know I have been positioning for a move lower in the market and today is the day. If you were along for the ride, congratulations! It’s not easy to book these kinds of gains, it requires discipline. Like Jeff mentioned, he was down a bit on many of these positions to start the week. But despite that, he was patient… and did the hardest thing a trader has to do… sat on his hands. He knew the charts were saying that the market was ready to rollover. He even bought calls on VXXB – an ETN that track short-term volatility – in anticipation of markets panicking when they did pull back. Then on Tuesday, he showed patience again. He went from being up $20,000 in the morning… to $40,000 in the afternoon… to $90,000 before the market closed. When would you have taken profit? Unless you have a plan, and discipline, pulling off these kinds of gains is nearly impossible. That’s why Jeff does a lot more than simply tell his Weekly Money Multiplier members what trades he’s executing in his account. He also shows them what he’s seeing in the market and the reasoning behind the trades he makes. He wants his members to be able to grow their portfolios on their own… to become experts themselves. If you’re ready to be mentored by the “Mensa” trader, go here. *Jeff isn’t the only options guru at RagingBull. Kyle Dennis is famous for turning $15k into seven figures trading biotech stocks, but lately some of his biggest winners have come from his Option Rocket service. On Jan. 8, he closed a 100% winner on Take-Two Interactive (TTWO) calls. He was in that trade for a whooping 1 day. Ten day later, on Jan. 18, he closed an 80% winner trading First Solar (FSLR). Again, he was in that trade for only 1 day. And just this week, he closed out a 53% winner betting against FedEx (FDX). *Jason Bond’s business is penny stocks. And business is good. Yesterday, he locked up a $6,000 from UXIN… $3,700 from VERI… … another $6k-plus from VTVT… and I could keep going. Yep, that’s a mind-blowing $17,000 IN ONE DAY and moves his total 2019 gains to $139,267.90. CHEDDA! Best of all, he’s donating all trading profits to charity. And members of Jason Bond Picks help decide where that money goes. We have a special offer running this week on “Options Vortex” — which grants you access to both Kyle Dennis’ Option Rocket system and Jeff Bishop’s Weekly Money Multiplier newsletter. But you can’t get this offer online. You need to call RagingBull’s VIP team at (833) 265-1270 for this exclusive offer. If penny stocks or options aren’t your thing, then I want to introduce you to Petra Hess. She makes trading simple using what she calls her “Tranquility Trading” system. 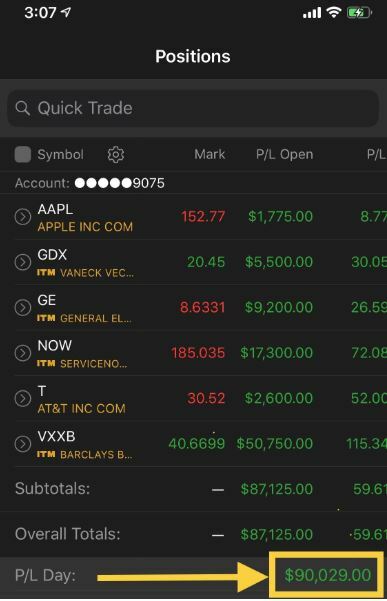 “2016 was the first year I tried to seriously be an active swing trader, with an occasional day trade, and managed to finish the year firmly in the red… You can see that I had $8,874 in losses last year. Learn more about Petra’s systematic way to making money here. Some of the best trades RagingBull produces are not sent out via email or text. They happen live in the Millionaire Roadmap trading room. Nathan Bear — one of Jason Bond’s student-to-millionaire success stories — spends hours every day showing traders how he finds trades and executes them live on screen. Nathan is on a bit of streak lately. Just this week he was up several thousand on ROKU, TSLA, TEAM, to name a few. But his best trade, in my opinion, came in Canopy Growth Corp (CGC). And If you’re a student of Nathan’s, I don’t have to tell you why. To most traders, the stock didn’t look very exciting. It was trending slowly higher… consolidating after a big move up. But that’s one of Nathan’s favorite setups. CGC was in a “squeeze” — which means prices were trading in a tight range. I like to think of of a squeeze as if prices were a coil being compressed, storing up energy for a violent breakout. Nathan had been buying calls on the shares throughout the week, waiting for that kind of violent move. But on Thursday, he purchased some “lotto ticket,” out-of-the- money calls that were about to expire…. josh luttrell set: 330%! thanks nate! 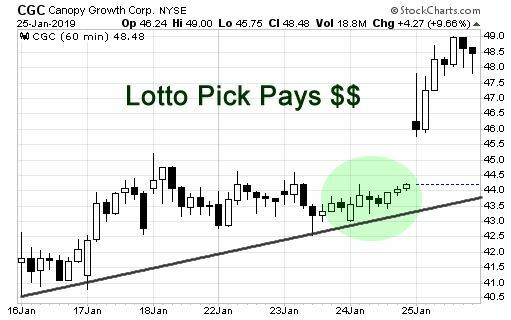 todd hui: Bought lottery ticket options yesterday on CGC…closed position this morning for 309%…thanks goes to Nate! venkatesh sam: sold CGC at 4.35 , wow 200% + profits!! ileana rod: made $29,000 on CGC option cant even figure the % I’m still shaking! Congratulations to everyone, until next time, good trading!